If you've missed the fact that JC Tran has been hitting on all cylinders this year, you haven't been paying attention. He finished 5th in the World Poker Open WPT Championship event in January, scored a 2nd place finish in the LA Poker Classic WPT Championship event a week later - and capped off March by taking down the WSOP Circuit event in Reno. Can you say hot? But there's another JC that people are just starting to notice out there; JC Alvarado (pictured). Juan Carlos "JC" Alvarado has grossed over half a mill in the last couple of months. 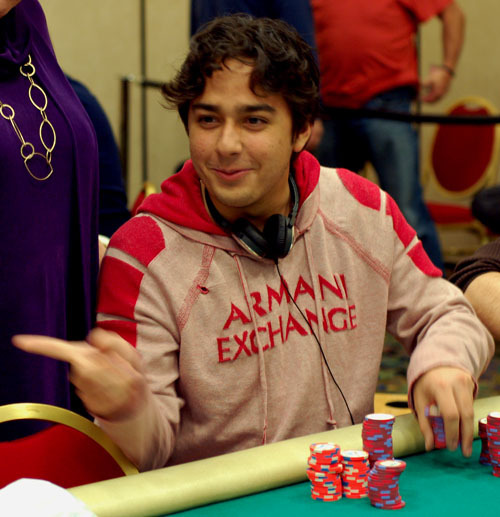 His run started with a second place finish in the LA Poker Classic's $2500 NLHE event. He made it down to the last two tables of the LA Poker Classic's Championship event with a 15th place finish. And he finished just behind JC Tran in Reno to take 2nd place. Alvarado also made the final table of the Bellagio's $2500 NLHE event this week, scoring a 6th place finish. Looking for a little online poker? definitly sympathic guy. congrats to his shippaments. These all are one of the best championship i really like it so much it is definately one of the great shipments these all are cool to know about it. I really like it so much it is definately one of the great shipments these all are cool to know about it. It is really one of the best championship these all are definitely very great and awesome i like it so much.